I was using Virtual Box. The step is pretty similar to any other VM (e.g. VMWare). 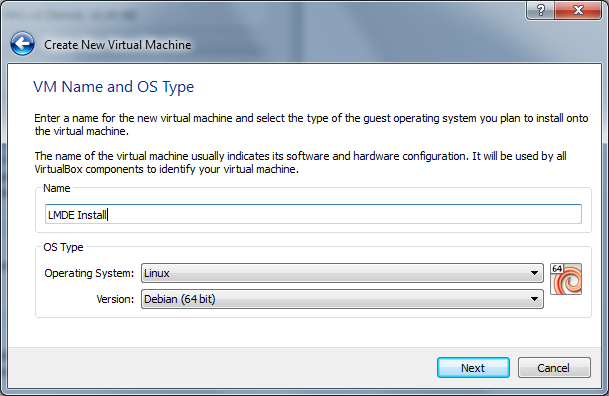 So let’s create a new virtual machine. Select Linux / Debian (or Debian 64bit if you are going to run a 64bit LMDE) as the guest system. I gave it 1GB of RAM and the default 8GB disk space. 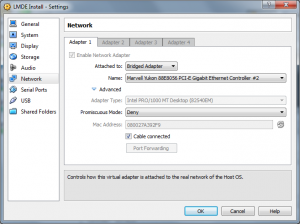 In the settings I changed the network adapter to “Bridged” mode. When you start the VM for the first time, it asks for a boot media. Select the LMDE image (e.g. linuxmint-debian-201012-gnome-dvd-amd64.iso). The Rest is straight forward. Install LMDE as you would do on a stand alone PC. You don’t need to create different partitions for /boot or /home as you would do it on a real install, since we transfer the whole file system later on anyway. Make sure that ssh is installed, so we can remotely copy everything over the network onto our real machine later on. It should ask you for your password and let you log in. Now boot into the LMDE Live DVD on your machine where you want LMDE to be installed. Open a shell and install some additional packages that we need to create an encrypted partition. On my system the drive was on /dev/sda. So from here on I use it as the disk device. Please replace it with the device that is on your system (e.g. /dev/hda). We need to create the partitions from scratch. We can use gparted for that purpose. Create a new partition table from the Device Menu. Then add a 256MB boot partition at the beginning of the drive. The rest of the drive is filled with a single unformated partition. This will contain the encrypted later on. In case you have already had data on your disk, you might need to delete preexisting partitions. Here is a screenshot of the final result. Now we can encrypt the partition. It’s also a good idea to fill the partition with some random data to counteract certain key recovery techniques. The first cryptsetup command creates the encryption. It will ask you for a password. Never forget it! The second command opens the encrypted device at /dev/mapper/sda2_crypt. In the next step we create several LVM logical volumes. You can think of a logical volume as some sort of partition that lives inside the encrypted partition. We also create the swap partition as a logical volume. That way the swap space is also encrypted. This will create a logical volume for the root, swap and home filesystem. If you want the last volume to fill the rest of the volume group, just enter a bigger amount then there is actually space left. From the resulting error message, you get the amount of extents left. Volume group "volumes" has insufficient free space (959 extents): 12800 required. It’s time to create file systems on our freshly created volumes. The boot partition will be formatted with ext2. root and home are formated with a journaling file system (e.g. ext4). During the following steps, we copy all the data from the LMDE installed on the virtual machine onto our real system. In order to access our new file system, we need to mount it. Now we are ready to transfer the LMDE installation. We are going to use rsync over ssh to copy all the data from the virtual machine. Replace remotehost with the IP address of the virtual machine. You can use ifconfig on the VM to find out it’s IP. We need to edit a few files to reflect the physical properties of our machine. Edit /mnt/etc/fstab to reflect your devices. Basically delete everything except the lines for proc und cdrom and add the mount points for / /boot /home and the swap space. Copy the current resolv.conf to the new system. That way we have a name server defined and can access the internet for a package update later on. Now it’s time to chroot into the new file system. chroot changes the apparent root directory for the current running process. That way we can work on our new system as if it’d be the current file system, even though it isn’t. We also need to mount some special devices in order for the devices and kernel files to be accessible. At first, we install some additional packages, so our system is able to access the encrypted partition and the volumes during the boot process. In case you’ll edit /etc/crypttab after installing cryptsetup, you need to run update-initramfs -u in order for the settings to be used during boot time. Finally we need to install a boot loader. I was using grub which is pretty much standard. Accept the default options. When asked for the GRUB install device, select /dev/sda (or whatever your disk device is). At this point we are actually done. But it doesn’t hurt to unmount everything and back out from chroot again. Let’s make sure everything was written to the file system and reboot. If all went well, you will see the GRUB boot loader during start up. Shortly after that, the system will ask you for the password in order to access the encrypted file system. After the boot process has finished, you are ready to use your brand new LMDE on an encrypted drive. Have fun. My question is in regards to the creation of the logical volumes. Did you actually use a larger drive size for your virtualbox machine? You cannot create a 50G partition on the size drive you show in gparted. Or am I missing something? Hey Tyler. Thanks for your comment. Yes, I had deliberately chosen the parameter too large. That way I got an error message which told me how many extends were really available. Then I created the "home" volume with the amount of extends that were actually left (in my case 959 extends which is somewhere between 3 and 4GB). Please reread the paragraphs describing the creation of the logical volumes. And by the way. You said virtualbox. 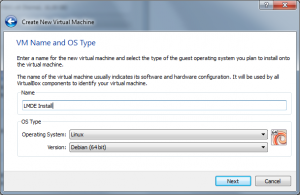 Don't create the encrypted partition in virtualbox. The virtualbox installation is only a template for the real machine, which is then transferred to the real machine with rsync. The encrypted partition (in my case /dev/sda2) has to go on your real machine. That's where you want to end up having an encrypted LMDE. In my case, the virtual drive in virtualbox was only 8GB. The size is irrelevant. It only needs to be big enough to hold the initial LMDE installation (a couple gigs will do I guess). Nice tutorial. A good tip is to use LVM parameter -l+100%FREE instead of -L. That way you don't need to bother with space stuff. Very interesting. This suggest me another solution for which I would like to have your advice. Suppose you don't have any other OS. As a disk can hold four primary partitions, do you think it would work, first installing the system on 3 primary partitions (/boot, swap and /), then install an encrypted lvm on the fourth, and transfer to that volumes as you did for the VM? Yeah. Very interesting idea. I have never tried it that way, but I don't see why it shouldn't work. Although the disadvantage is, that not all of your hard drive space is used at the end. You don't even necessarily need to separate /boot and /. And if you have enough ram, you don't need swap either. So you would only need two partitions. Maybe you could even create the initial partition at the end of the drive. That way it would be easier to enlarge the resulting encrypted partition across the whole drive. In the old days, there was a limitation that a boot partition could not be after a certain cylinder of the drive. I am not sure if this still applies nowadays. Also, I have never enlarged an encrypted partition. I am not sure if it is as easy as with a normal partition. and from there, I followed everything you said, and it worked like a charm. doing it this way might be significantly faster if you have the RAM to spare. Not bad, Dylan. I am sure that worked out a hell of a lot faster. Aaaaaaand this is why LVM support should be added to the installer. Good tutorial though. Easy to understand for the most part. I don't know if this would cause any problems, but for now it works just fine for me. Thanks for the article, hope my comments help other people. I haven't done this in a while. Maybe something changed in recent releases. Thanks for the info. If you use lvcreate -Z n and don't zero the volume lvcreate warns that trying to mount an unzeroed logical volume can cause the system to hang. Is there any other way? So zeroing the volume? I wouldn't like to get an unstable system. 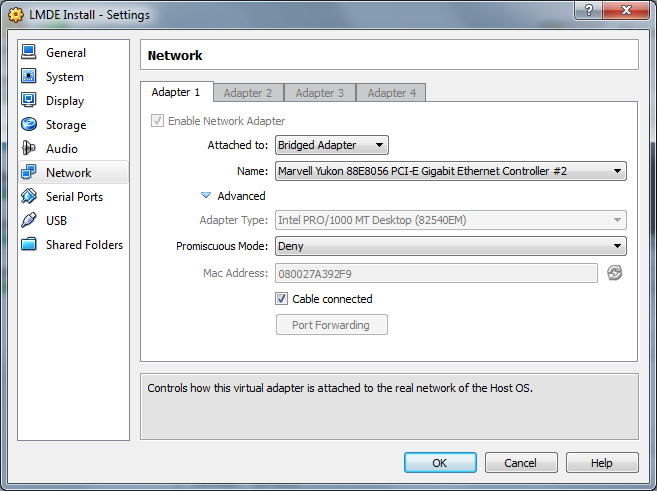 OK, sorry about that last comment, I had my Virtual Machine network set up wrongly, it works now! Thanks Pavol, for sharing your discoveries here. I haven't looked at it in detail yet. But next time I need it I'll try your way.